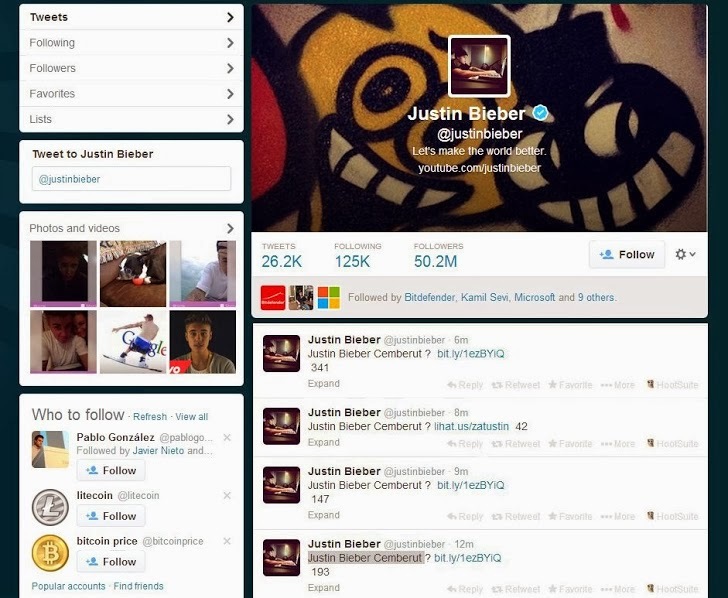 Popular Pop Singer Justin Bieber official twitter account got hacked today. The twitter account have the 50.3 million of the followers, which is the second most twitter follower account. Hacker have hacked into the accounts and tweeted with a link which directed to the malicious app named as "ShotingStarPro". Hacker tweeted in Indonesian language reading “Justin Bieber Cemberut?”, means - "Justin Bieber sullen?". It can also be says that twitter account was hacked by any Indonesian hacker. Spammed tweet contains the link that was redirected to the website rumahfollowers[dot]tk , that host "ShotingStarPro" app. Soon after the hack Justin team have recovered the accounts. Team had deleted the spam tweets and made respons tweet, saying "All good now. We handled it.". He also warned his followers, "That link from earlier. Don’t click it. Virus. Going to erase this now. Spread the word. Thanks." As account have been recovered after 15 minutes of the hack, but the spam link that have posted by hacker should have compromised thousand of Justin's followers accounts. We like to tell all you people that , if you are one among them then immediately change your password and set new, unique and strong password. We also recommend that do review all the apps that you have associated with your accounts. and revoke all the malicious apps from your account, specially this recent one.